I am reading this book by Neil Parischa, called the 'Happiness Equation'. I'm about 25% done and I thought it was a brilliant book - brilliant enough to share some of the stuff here. One of the interesting things I've read in the book is the concept about success. Any kind of success. It's really a triangle formula depicting the elements of success. Sales success is about sales. Able to sell multiple copies if you're selling something. Able to get promoted if you're talking about career. I think this is what we see as tangible results based on common markers of success. Even a counter telling you how many visitors came to your blog is about sales success. Social success is about being successful among your peers or people that you respect. If your co-workers think you are successful, you're likely a social success as well. The industry that you're working in gives you compliments and look up to you for advice. Self success is about being successful in your own mind. It's not tangible and only you will know it. Self success means you had achieved what you set out to do and is genuinely proud of your accomplishment. Even if nobody knows it, you know it and you're happy. Some people think success must have self success to feel meaningful to yourself. The trick is that you can only take 2 corners because while not being mutually exclusive, they kind of hinder each other. Let's apply it to my work as a private tutor. I have a waiting list of students if they want to join my lessons. Every year there'll be recommendations by ex students or parents for the past 12 yrs so I think I did my marketing and soft sales pretty okay. There's only 2 years where there haven't been as many students as I would have liked, but on average I think I am pretty okay in this department. I'm very happy with the achievement and the progress that I have. The autonomy and the independence I have in this career is fantastic, and I tap dance myself to work everyday (okay, almost everyday). I can see a project from birth to end and take part in all the steps, so there's a lot of meaning and significance in the work I do also. Try thinking of anything in this framework. It might open up your eyes to why you are not getting the kind of happiness from it OR why you are so happy with the kind of thing you're doing. Success is anything and everything that derives sense of achievement, satisfaction, accomplishment,happiness and contentment for oneself provided no one was hurt and the law was not broken in the process. For my part, I took up bread making recently with help from book recipes and the internet. Although I had attended informal bread making classes at a CC nearly 22 years ago, I was a failure at making good-enough-to-eat bread that I gave up. Perhaps then I had no real interest but now, much older and retired, with time on hand, the idea had re-kindled with more zest. I attempted the first few loaves with limited success and persisted with help from Youtube versions of bread making and books at the NLB, I have finally succeeded in making good-enough-to-eat bread. My white breads are consistently soft with every bake. A skill that I learned and mastered and to me this is success. "Success is what we have to sacrifice to achieve it". Absolutely agree. What is the cost to reach this height of achievement? I think people tend to look at the reward side of the equation without looking at the downside of it. I also agree that it's hard to achieve 3. The book mentioned that we should focus on 1 first. Then slowly spread to 2. If we can hit 2, already hallelujah! That book is quite fantastic - even have your oft-mentioned ikigai (the reason why you wake up every morn) haha! 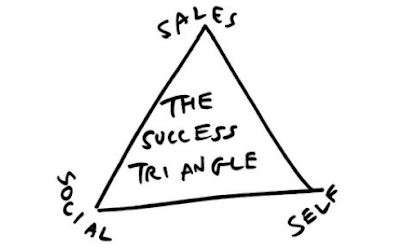 I think of the saying "To climb the corporate ladder,you need to kiss the guy in front and kick the guy below"
Using the triangle analogy , you will have +sales and + social success but -self corner.How could you reconcile with yourself if you kick the poor guy below ? OR is it + sales corner , + self corner but -social corner ? You may have sales success and doing very well self but earn the wrath of social . Hmm, I guess it depends on personality or alignment. If you're a lawful person climbing up the corporate ladder, you'll see yourself as +sales +social but -self. You might rationalise that you're given the mandate to lead. If you're a chaotic person, doing such skulduggery might be seen as +sales +self -social. But who cares what others think about what you're doing as long as you're ahead of them in the end? Many successes in life come after failures!